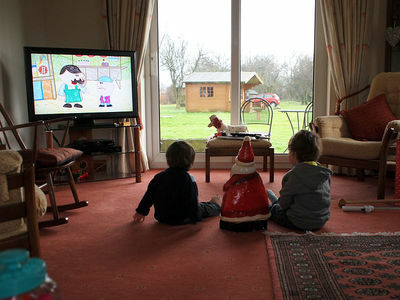 Children's TV's shows are plentiful to say the least, so how do you choose what programs your child watches? Depending on the age of your child, it may be important to ensure the overall appropriateness of the program they are watching. Additionally, if you're seeking a level of educational value from the program they are watching, do you have to do some research to choose the best show around, and if so where do you go to seek out recommendations? How have you chosen what your child watches, or are you happy for them to choose themselves, within reason? I don't have kids, but I know when I was little, what my mum used to do was record all the early morning children's programmes on video, and then when it came to TV time, she would turn the video on for me, and I'd watch that way. I love Sesame Street for it's educational content. If it's just for entertainment, I'll let them watch G rated shows, but check out the content of PG rated ones. When they were younger, I watched at least 1 episode of everything I let the kids watch just to make sure it was ok, and have found that the ratings are fairly accurate. I would never let them watch anything M rated as it is just too mature for them. My older kids pretty much decide for themselves these days but I will watch a show with my youngest to see if it's appropriate. Most cartoons etc seem to be fine. I most certainly do and no amount of pleading is going to change that. Cartoons are written by adults some with very sinister agendas so I cant just let them teach my children at will.